Being in the business of industrial machine producing for over 7 years, what we would advise all of the purchasers with respect to Bolt Threading Machine is to have a point by point discussion on what are the customization’s that you really require in your Bolt Threading Machine.What’s more, to get the Bolt Threading Machine according to your redid necessities, it is constantly best to purchase this machine from an accomplished Bolt Threading Machine in India and when it happens to best, there is no name in front of industrial machinery corporation. With its manufacturing unit situated in Ludhiana, we have over seven years of involvement in making best quality Bolt Threading Machine. 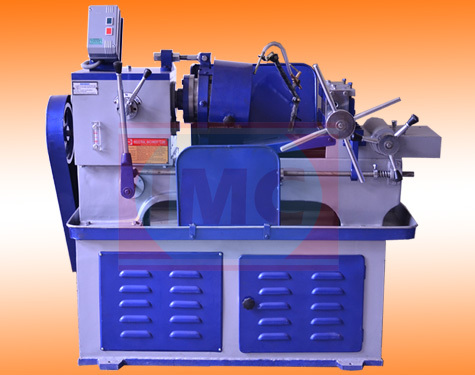 We have been serving every one of our customers with best of industrial threading machines and not just this; we have been giving excellent after deals benefit, in the event that, any of our machines face any technical issue which is extremely rare. We have from time to time, demonstrated that the Bolt Threading Machine worked by us is the best in the lot and the explanation for this is we make this Bolt Threading Machine with international guidelines and keeps all the international trends and parameters. Design & Workmanship - The Industrial Machinery Corporation Bolt Threading machines are designed to produce quality threads within the tolerance for which they were intended. Head Stock - A heavy duty geared Head Box is of best quality casting providing support to the spindle bearings. The box is of gear type, lubricated, fitted with three extra heavy duty bearings. The Bed - The bed is pillar type having two pillars made of best quality steel nicely finished & duly hard chrome plated in the most modern hard chrome plating unit. The Saddle - The Saddle is fitted on two pillars very precisely. It runs on pillars very smoothly and accurately to the Head Stock alignment. The Apron:The apron gives movement to the saddle with head transfer along with pillars through steel rack and pinion arrangements. It’s all gears are made of best quality steel. Vice Jaws - The vice jaws made from the best quality alloy steel are fitted on the saddle well aligned with the head stock center fitted in a heavy duty box type vice. The jaws are heat treated. The movements of jaws are controlled by a screw on the saddle.